All transactions are safe and secure with a reliable history in online purchasing behind each of our associates. 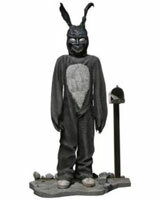 Buy the Donnie Darko Frank the Bunny Action Figure to own Donnie Darko clothing and merchandise. This collectible Frank the Rabbit action figure stands twelve inches tall and says seven different motion activated phrases from the movie. It ships with a detailed mailbox-adorned base for display, an alternate unmasked head and the letter for Donnie. Captivate your friends with this hauntingly detailed figure that is perfect for fans of the cult film starring actor Jake Gyllenhaal. In addition to the Donnie Darko Frank the Bunny Action Figure above, browse the Donnie Darko Clothing Gallery for more apparel like men's and women's clothes, kids shirts or hoodies.